Information (and archive photos) courtesy of John Millin, who was a projectionist in Cumnock for more than 16 years. A current rear view of the auditorium exterior is here. 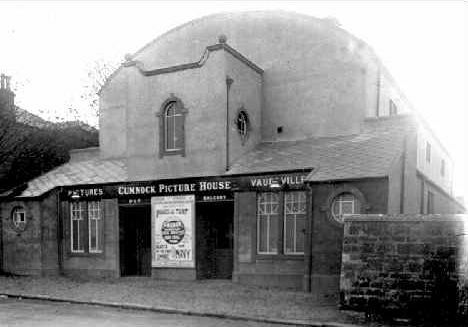 Cumnock Picture House was one of two cinemas owned privately by a Mrs Ward, who had inherited them from her father (the other was in Auchinleck). Cumnock was the first purpose built cinema in the area, opening around 1913 (although some sources suggest as early as 1910). It had 400 seats on a single level. In 1973 it converted to bingo and cinema, before finally closed as a cinema 1980. The building survives to this day as a bingo hall. 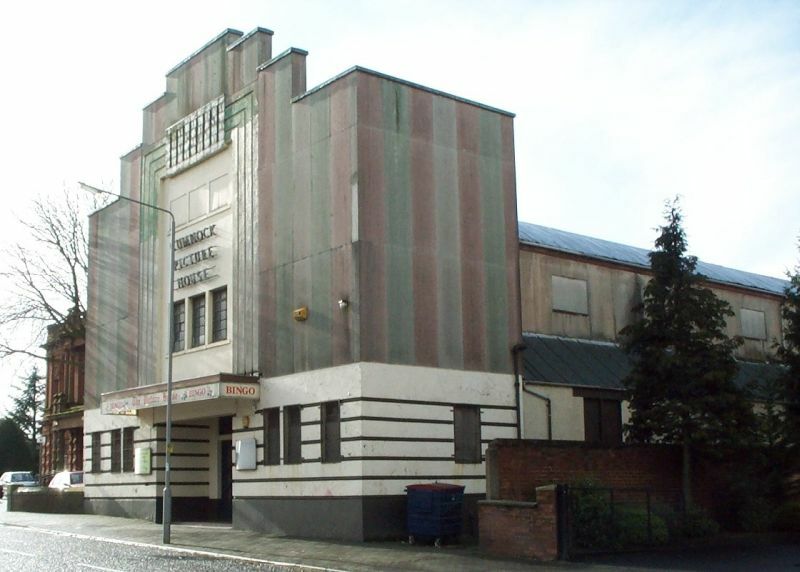 Originally advertised for both cinema and Vaudeville, it looked like a barn with the original frontage comprising a neat three-sided shaped sandstone façade with two circular windows on either side of a large curved top window. The projection room started life as a separate add-on room on the roof of the original entrance frontage. Access to the projection booth was via a ladder through a hatch in the ceiling of the foyer. In 1920 the original projector was replaced with two all electric projectors. These were supplied with all their electricity needs from a generator situated at the back of the building. In the thirties the building had a major refurbishment including a rebuilt new front façade, that incorporated old projection room and covered the whole front of building. New Projectors (Kalee 11’s with sound on disc) were also installed at this time. These were supplied with both small screen and wide screen lenses, so they were able to show all the latest films, newsreels, and gazettes in colour, as well as the old silent films. It is unknown when they were modified for optic sound. In 1949, as things improved after WWII, the systems were re-equipped, this time with the Kalee KT21 fully enclosed projector with total fire fighting ability. Westrex sound system, Kalee 60w amp and Westinghouse 80Amp arc rectifier were also installed. In 1956 these were modified to handle Cinemascope. The Kalee 21’s stayed in service till the end of the cinema shows in 1980. In the early 1960’s a completely new three coloured vertical stripe asbestos type cladding was put on the upper half of the façade; the lower half being painted with horizontal stripes. It is this decoration that is still visible on the exterior today. The interior changed little over the years, and was all on one level. What was called the balcony consisted of the top 12 rows of seats above the cross aisle and separator towards the projection room. Access was from two side door entrances, whilst the two hallways continued into the stalls. The stalls were two blocks of seats with a central aisle, and separated from balcony by a wooden separator and a row of seats. The front stalls were 6 rows of seats with wooden backed separator. The interior had fluorescent lights hung from the ceiling for bingo but all other original décor still exists. Pictures below from June 1985 courtesy of Paul Francis.